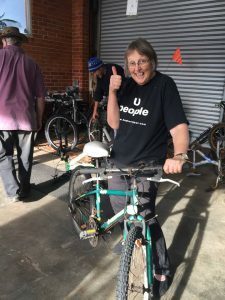 A great time was had by all at the Bike Repair Cafe on the 30th of March, fixing bikes for locals! How rewarding is it to see people with massive satisfied smiles on their faces. A big thanks to our bike mentors, Richard and Glenn and thanks to our volunteers Maureen, Pam and Stephen. We changed and fixed seats, cogs, gears, peddles, tyres, wheels and brakes. 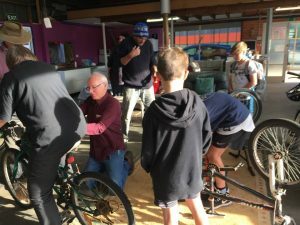 Ten local boys brought their bikes and scooters in and learnt how to service them. Another two boys helped fix their tyre punctures. Three people rode the E-Bike around town and they loved it! 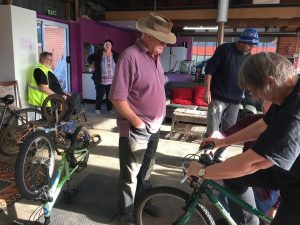 One fellow, Bevan, could not get the smile off his face, he even went home with a bike to fix up with his carers. Healthy platters of fruit, veggies, dips, cheese, fruit cake, juice and hot drinks where provided. We hope to have another one in the school holidays. Keep an eye out on Live Well and the Wynyard Notice Board Face Book pages. If anyone has any bikes to donate for us to do up and give out to disadvantaged people we would be more than happy to take them. Feel free to join us in this enterprise. Get in touch if you would love to help out with your bike maintenance skills.